It is July 13th, 2013 and I am outside the 7-11 on Harrison Street interviewing the Polish duo known as Etam Cru. They hand me a 4 x 6-inch pencil sketch of a small bird, explaining that they’ll be painting a girl in a mason jar on the two story wall across the parking lot. Then they handed me even more sketches on even smaller bits of paper, while I try and imagine how this might come together. 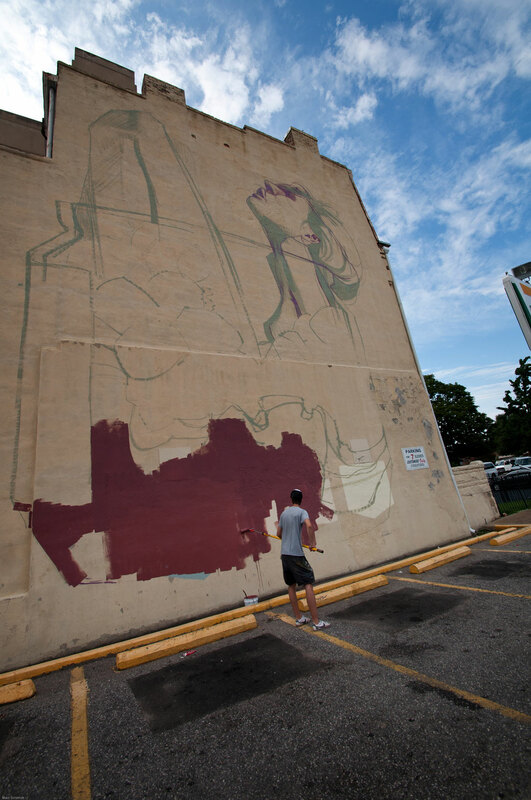 As the next few days go by, people stop and stare at this new artistic monument being created – not many residents had ever seen a painting like this before. The RMP kicked off in 2012 with an amazing lineup brought together by Shane Pomajambo of Artwhino. It was exciting to meet artists from around the world and have them here, but not all the artists felt the same. We spent a lot of time together talking about the world and the impact their work could make in a city like Richmond. The joint-smoking Belgian artist Roa had opinions for days on America culture and politics and had a friendly but intense discourse with the expressive, hand waving Italian Pixel Pancho, while Aryz, the quiet but brilliant Spaniard, would chime in between the debate — all three would put their thoughts on our city walls before they left. Late one night, Roa and I were discussing the state of American politics over a spliff at the Crowe’s Nest. He had traveled the globe creating murals and gave me his view of how the US was viewed by the world. It wasn’t a kind assessment, and he brought that into his first mural in the city. 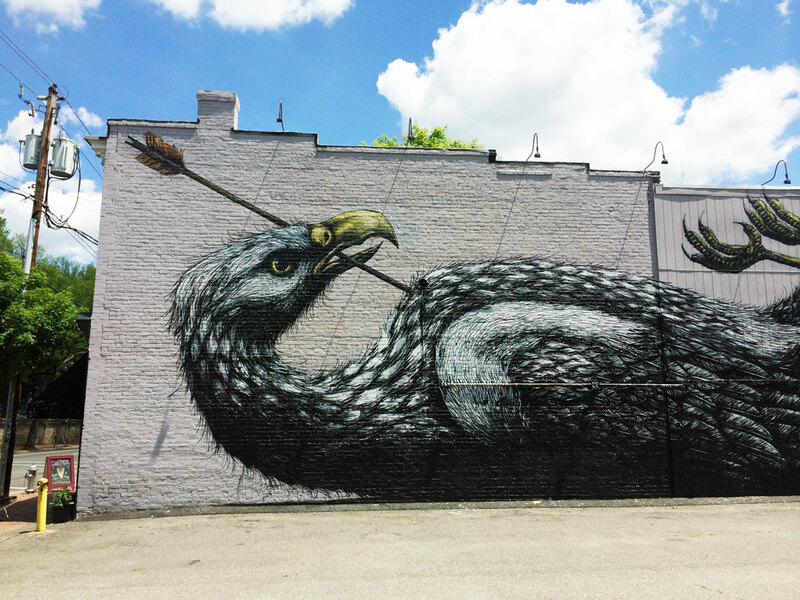 He settled on painting a young eagle since it is native to Virginia and the US’s national symbol — then he put an arrow through its chest. I watched him paint this for days thinking is anyone going to be upset by what he is doing? A few days later Pixel Pancho responded with this Captain ‘Merica mural down in Shockoe Bottom. I watched as his painting elaborated on a personal political statement for the US, forever enshrined on this two-story brick building in Shockoe Bottom — the decapitated head of a robotic Captain America left to decay. Again, I waited on anyone to bring up its meaning to me but after five years, no one has said a word. 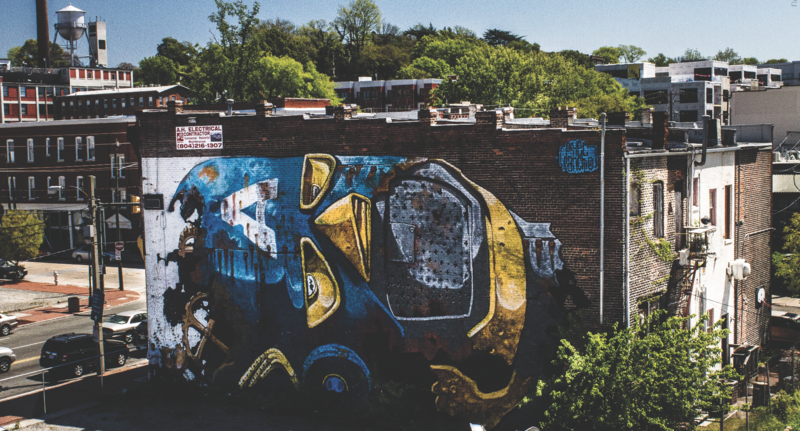 Aryz left his statement in The Fan with this mural — a diss on everything “American”. That year on the RMP, I had a feeling that Aryz wasn’t very thrilled, so when this stinky-wall-eyed elephant eating a spoiled hamburger was created, it felt like a farewell middle finger to the city. It was funny to hear the neighbors complain about its content while representing everything bad in the painting, the irony. Maybe they were Aryz’s inspiration? Who knows. This was his last completed work before he flew out of the city and never came back. 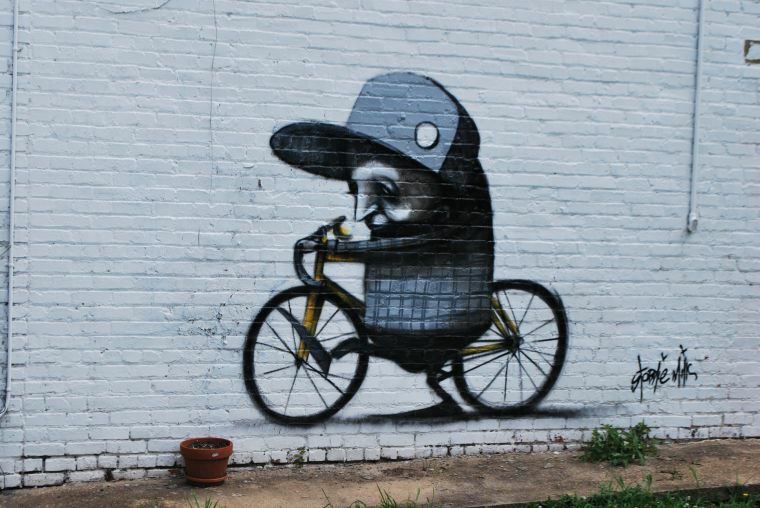 When this went up on Harrison Street on VCU’S Campus in 2014, I had a few people tell me this was their least favorite mural so far. I thought it was one of the most interesting with a message of togetherness between people under the watch of a higher power. When speaking with EVER, I found him to be a mellow soul and a positive spirit. People should give this mural a second look to reconsider its message. During my time at RMP, I met Stormie Mills. A man of many silver rings, chains, and necklaces, with wisdom, peppered locks, and a zen personality that drew people to him when we would venture out into the city. He painted introverted pieces of simple pleasures, little secrets, and conflicts. You can check out our interview with him from 2013 here. I could see an important piece of what we were trying to do when Pixel Pancho started creating this mural on Hull Street in 2012. The area was ignored by the city and a bit run down, but when the paint started going up, the neighborhood came out in droves to support it. There were little kids running along the length of “the grasshopper” with their parents stopping to comment to their friends and family. Businessmen were coming out of their shops to see what was happening, while groups of teenagers were taking photos to send to their friends. Over the next few days, as Pixel Pancho worked, the mural became a point of conversation and something positive for the community. I remember thinking that art could transform any neighborhood. 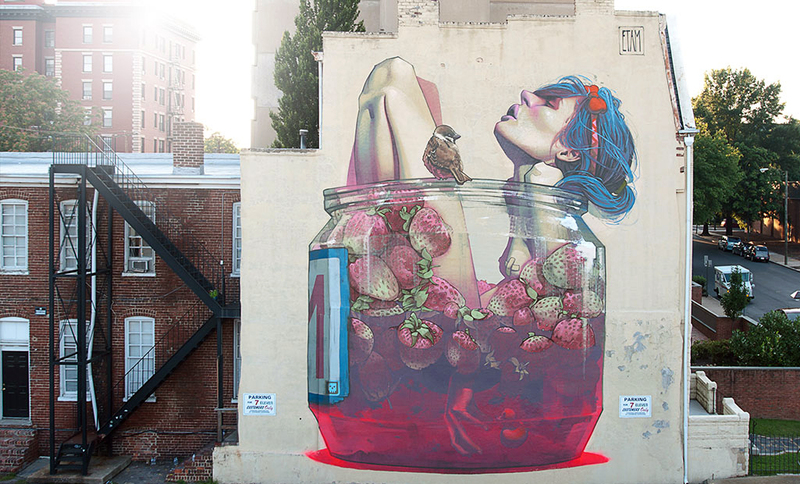 Since that time, street art did change the Broad Street Arts District. Maybe it’s time to go back to Manchester and expand on what Pixel Pancho, the RMP and RVA Street Art Festival started over there? 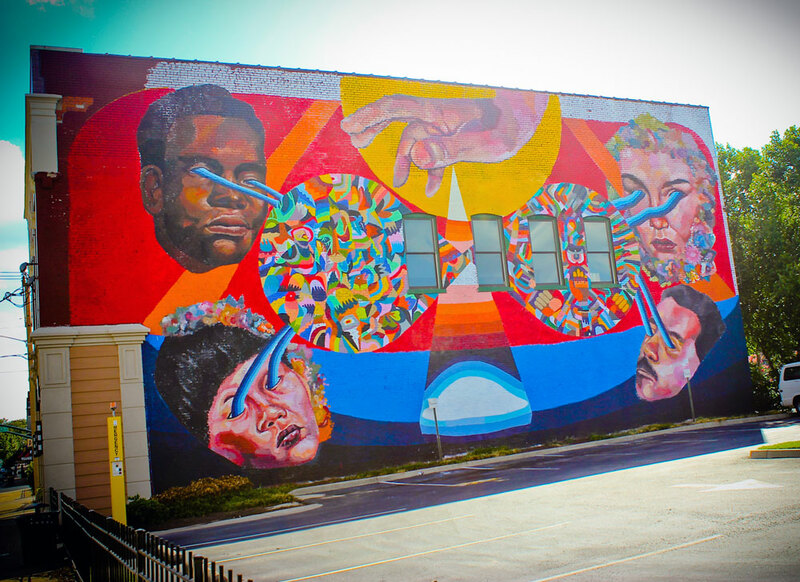 In 2015, we were allowed to paint a massive mural on VCU’s psychology building at the intersection of Broad and Lombardy. It was a big deal, getting VCU involved with anything takes time, and having that particular corner would be a prime spot for any artist. 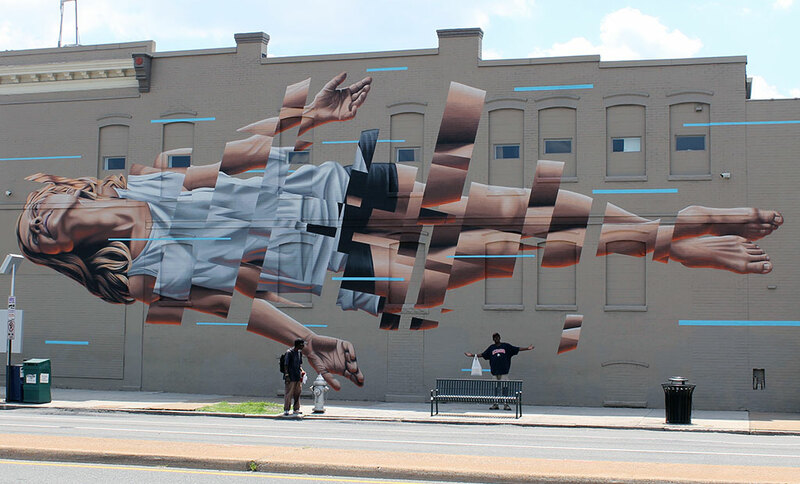 Situated on the bus line, at an incredibly busy junction with high visibility, James Bullough created an unforgettable work of art that is impossible to miss. Once the dust settled, I got the interview here. You can check out RVA Mag’s rundown of Bullough’s work here. Meeting Ron English was a big deal. I had been following his career for over a decade as an activist artist with his ongoing POPAGANDA project and one of the first street artists to break into the main stream consciousness. He was full of stories — running around putting up art with an edge of fearlessness that I took to heart — you can listen to the full interview here. You can also read RVA Mag’s coverage of him here. His ‘Have A Nice Day’ mural was a hilarious statement against capitalism painted on a building owned by a mega corporation that’s based in town. I can’t believe we got away with that. These are just a few of my thoughts from my time working on the RMP with Art Whino. The RMP has been vital to Richmond because ultimately art and the expression of ideas and concepts is important to the long term viability of any growing city. It connects people. Until next time, I leave you with a video from the RMP. 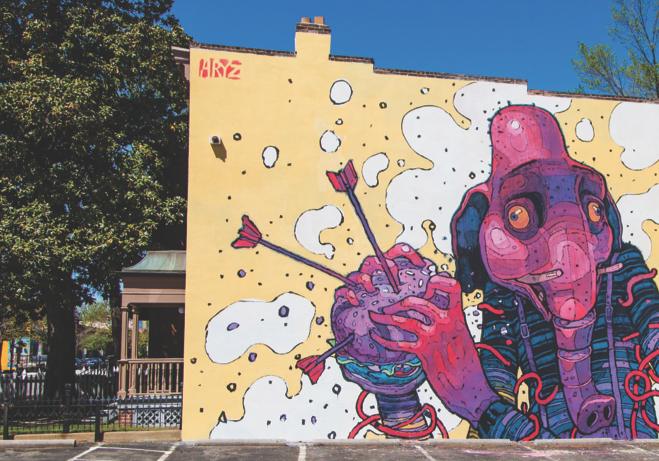 When you combine a variety of graffiti artists, a 100-feet-wide by 20-foot-tall blank canvas, and a dash of entrepreneurship you get the Second Annual Virginia Street Art Festival in Waynesboro, Virginia. POW! WOW! Washington DC, the global art movement that celebrates culture, music, and art worldwide took over the District during the last ten days of May as POW! WOW! DC. The same family that brought contemporary art to Virginia were pushing the idea of what a retail store should look like in the 1970s and 80s. Check out these (almost) forgotten photos and article from Failed Architecture on the influence of the Sydney Lewis Family across America. Richmond knows how to celebrate. I know it’s only Wednesday, but I figure we could all use a little mid-week reminder to get angry about something.